The junior signal caller dominates inferior opponents. 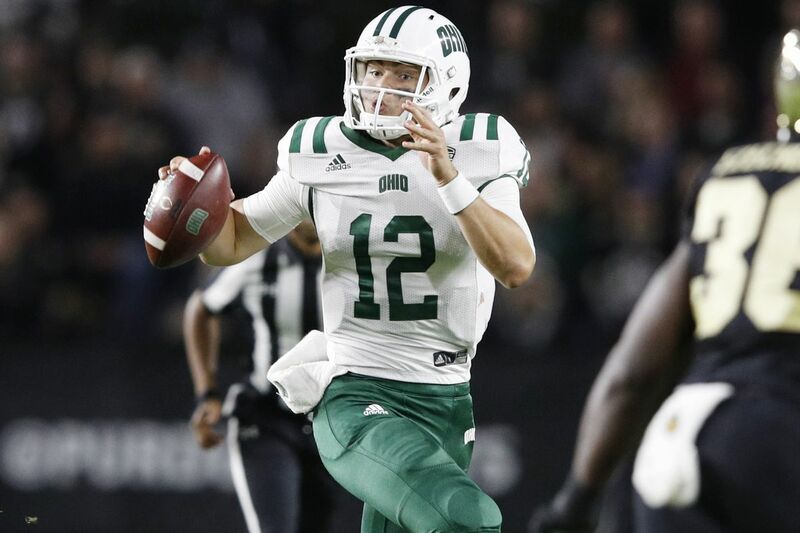 During the last two years, he eclipsed 400 yards passing against Missouri State (512), Eastern Michigan (450) and Delaware State (402) and combined for 17 touchdowns in the matchups. Over the last two weeks on the road versus Georgia and Kentucky, Lock has 608 yards passing and seven aerial strikes. The Tigers are 14-point home favorites against Idaho, and Lock surely completes another four touchdowns. The dual-threat competitor ranks among the top college alternative-reality field generals over the last three weeks, scoring 39, 32 and 40 points. Rourke has rambled for over 100 yards rushing in each game and reached the end zone eight times. He also has 446 yards passing and three aerial strikes. The Bobcats are huge favorites at home, and Rourke scores early, and often, to secure an easy victory. Last Friday, Syracuse upset Clemson, the defending National Champions, at home. As a 16-point underdog, the Orange strolls into a Hurricane on Saturday at Miami. Malik Rosier posted his worst fantasy outing of the season against Georgia Tech last weekend with 21 points. Over the first four games, Rosier recorded 27, 34, 31 and 27 fantasy points. He tops 30 points versus the over-confident Syracuse defense. Finally, coach Mark Dantonio fed his stud ball carrier: Scott garnered 25 carries against Minnesota and rushed for career-best 194 yards and two touchdowns. The junior runner missed the Michigan game two weeks ago and returned to lead the Spartans to victory last week. The Hoosiers yield over 170 rushing yards per game, ranking 11th in the Big Ten. Michigan State is ranked eighteenth in the nation and 7-point favorites at home on Saturday. Coach Dantonio wants to run the football to capture another Conference Title, and Scott should earn at least 20 carries against a poor Indiana run defense. Editors note: On Wednesday, Scott arrested seventh time for driving without a valid liscense...Game status unknown. Seeking a deep sleeper who can eclipse 20 fantasy points? Check out Nevada’s 5-foot-10, 220-pound sophomore. In back-to-back games, Moore has scored 24 and 35 fantasy points with 245 yards rushing, seven receptions for 121 yards and two total touchdowns. Air Force ranks #126 versus the run, allowing 255 yards per game and 17 TDs. Moore can still be gobbled up off the waiver wire and inserted into lineups this week. In four straight games, the coaching staff furnished Ellis with over 20 carries, and the junior responded with more than 90 yards rushing in each, including a season-high 136 last week against North Carolina. The Eagles employ one of the poorest run defenses in the nation, ranking 124th and allowing 242.4 yards per game. Ellis effortlessly posts back-to-back 100-yard outings and reaches the end zone for the seventh time this season. Coach P.J. Fleck guided Western Michigan onto the national stage behind an exciting aerial assault. Fleck inserted sophomore quarterback Demry Croft into the game last week, and he heavily targeted Tyler Johnson, who scored three times on eight catches. At 6-foot-5 and 205 pounds, Croft is a dual-threat quarterback with a live arm and is scheduled to make his first start against Illinois on Saturday. Johnson, a 6-foot-2, 190 pound sophomore, will likely be targeted often by Croft once again. All season, I have identified sleepers against the UConn secondary and been highly successful. No reason to stop now. Las Vegas expects a high-scoring affair and the Golden Hurricane are projected to score 41 points. Averaging 20.1 YPC in the last two games, Johnson has logged 11 receptions for 222 yards and a touchdown. Tulsa will run the football successfully against the Huskies; however, there will be opportunities over the top of the secondary for Johnson, who is a wise investment this weekend. There is no doubt that the Missouri offense overwhelms lower-level competition and the passing game will soar once again versus Idaho. While the pass defensive statistics look good for the Vandals, the numbers have been accumulated against FCS, non-Power 5 and Sun Belt Conference opponents. The Tigers are big and fast at the skill positions, and at 6-foot-3 and 200 pounds, Hall presents a major challenge for the secondary. In the last two games, the junior has snatched eight passes for 270 yards and three touchdowns while averaging 33.7 YPC. Still available on 96% of waiver wires, it is time to move the needle upwards on Hall’s ownership levels in college fantasy football.